Just A Dream is the follow-up to Moreland & Arbuckle's 2010 release Flood, their second set since joining Telarc. Despite relentless worldwide touring, guitarist Aaron Moreland said the band took more time in the studio, sweating the details, rather than setting up in one room and going for broke in just one or two takes. The results feel more substantial and polished than its predecessor but without sacrificing too much of the rawness vital to their sound. The album is more a continuation than a bold new direction, leaving the success and failure largely to the quality of the material. First single "Purgatory" opens with a sinister riff from Moreland, who returns later in the song with some dirty lead slidework. There's a lot of distortion, fuzz, and rawness creating a fire-and-brimstone atmosphere but Arbuckle doesn't match the sinister intentions of the lyrics and riff vocally. He's too restrained; if he sang with the kind of fire he rains down with his harp, this tune would have been monstrous and badass. Instead, it's very good with some strong playing. Tom Waits' "Heart Attack & Vine" gets put through the Moreland & Arbuckle filter, meaning it gets heavily coated in rootsy sludge but with some nice keys from Chris Wise. "Gypsy Violin" is a fun, disposable piece that fits like something artists used to put at the end of Side A of a vinyl LP. It's a minute-and-a-half bit of slide riffing from Moreland with some nonsensical dialog bits alternating between the left and right channels. It's good to think of it as the last song on Side A because it's a terrible lead-in for "Shadow Never Changes," a rootsy piece opening with a deep blues vibe before speeding up into blues-rocker. "Good Love" is a standard blues-roots composition not dissimilar from what we've heard from these two before but Arbuckle's distorted harp injects it with grit and life. "White Lightnin'" is a Steve Cropper-penned tune that Moreland and Arbuckle took some serious liberties with when arranging it. The legendary Stax guitarist joins them on the track and brings the album to a satisfying close. 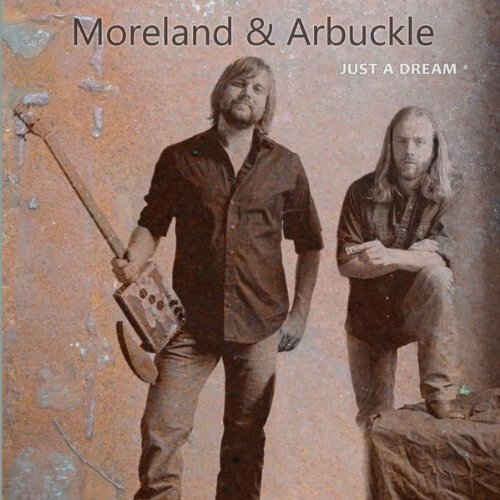 The material on Just A Dream is often good -- rarely great -- but well executed, resulting in a solid collection and a good representation of the roots-rock approach to blues that is the Moreland & Arbuckle sound.